John Van’t Hof was born on August 30, 1927 to Cornelius and Johanna (Schmidt) Van’t Hof near Leota, Minnesota. He was raised bilingually, as his family spoke primarily Dutch at home. He attended country school in the Leota area. After his education John worked at Mouw’s Hatchery and helped on various local farms. On January 16, 1951, he enlisted in the United States Army. He served a two year active term and was later honorably discharged on December 28, 1956. During his time in the military, John specialized in anti-aircraft artillery and spent a tour in Korea during conflict. Shortly after his discharge, he was united in marriage to Joan Katherine Jeffer on January 17, 1956, in Leota and they lived with his parents for a time. Soon after, they moved to Norwalk, CA where John began his career as a truck driver hauling cement powder. They later moved to Milwaukie, OR and he began driving for North American Van Lines. In 1972, the couple returned to Luverne, Minnesota due to the fact that it more often crossed paths with John’s trucking route. After their children graduated, they relocated to Merrifield, Minnesota until retirement when John returned to Edgerton, Minnesota. John entered the MN Veterans Home in Luverne on January 8, 2018. 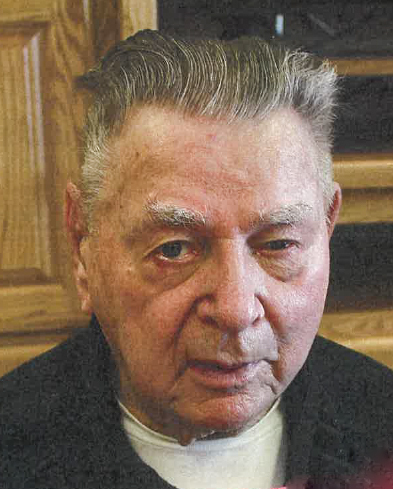 On Tuesday, March 19, 2019, John passed away at the Sanford Luverne Hospital at the age of 91 years. John was a member of the First Reformed Church in Edgerton. He always loved going for drives around the area to see the sights or visit relatives. He enjoyed playing Rook with his siblings while the cousins played ball together. Possibly due to his time spent on the road, he was always content with his own company and was perfectly happy to quietly appreciate the activities and conversations of his family. During his later years, he enjoyed playing Bingo and participating in the various activities at the Veterans Home. John had an affinity for ice cream and sweets, but his family will always remember his love for morning oatmeal along with the specific recipe and favorite bowl needed to complete the experience. He will truly be missed. John will be remembered by his children, Dawn (Dennis) Vanderbeek of Edgerton and Terry (Tammy) Van’t Hof of Red Lake Falls, Minnesota; grandchildren, Teresa (Daniel) Nyquist, Loren (Morgan) Vander Beek, and Joni Vander Beek, Heather (Joe) Bregier, Michael (Stephanie) Hallstrom, Bryce Hallstrom, and Katya Vant Hof; great grandchildren, Case and Kurtis Vander Beek, and Evan and Lilly Bregier, and soon to arrive Eli Hallstrom; siblings, Leonard (Bertha) Van’t Hof of Edgerton and Bertha Gilbertson of Iona, Minnesota. He was preceded in death by his wife, Joan; parents; son, Dale Van’t Hof; and siblings, Cornie Van’t Hof, Anthony Van’t Hof, and Johanna Hubers.